Each year, our team of international vehicle importers ship cars to the USA from Europe, Australia, the Middle East and many other countries around the world. Other types of vehicles include classic autos, trucks, motorcycles, motor homes, RVs, boats, agricultural/industrial vehicles and many others. Our team understands the detailed process of importing cars to the USA and knows how to handle a variety of different types of imports. 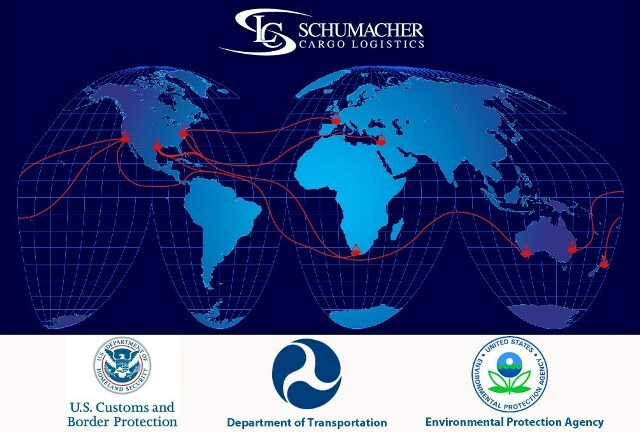 Schumacher's import specialists will guide you through the entire process and help determine which category of vehicle import your shipment belongs to based on the intent of your stay. Examples of the different categories of imports include permanent imports and temporary imports. To permanently import a vehicle to the US, you either have to be a U.S. company, citizen or hold legal status to work and live in the country. Check your vehicle's eligibility with our easy auto import tool. Whether or not a vehicle qualifies to be imported depends on the engine. That is why the requirements apply to boat imports, cars, motorcycles, RVs and most other vehicles. Otherwise, your car, truck or motorcycle simply cannot be imported without special approval from the import authorities below. You will first need to fill out an application with the DOT and EPA. If you do receive the special approval, you will still need to convert your vehicle, which often makes importing it much more expensive and impractical. The following is a list of the government authorities that car importers are involved with and to whose standards each and every vehicle must comply. We've supplied the contact information. Visit our page on the guidelines for importing cars to the USA to find information on nonconforming vehicles, applications and approved/disapproved vehicle lists or fill out our online quote form to get a rate from a fully licensed and bonded international vehicle importer!